Ignorance is NOT bliss. Read I Peter 1:14-21. As a Christian every word, action, and deed should be done for the glory of God. To celebrate is to observe, show happiness, or mark an occasion. At the least, do a study on the origins of “Easter” before deciding to observe it. Words mean things. After a careful study, why would you even want to use the word “Easter”? What purpose does it serve to call your celebration by that word? Isn’t Resurrection Sunday a better, more accurate description of what we are celebrating? Which one points more people to God? The Easter symbols of bunnies and eggs are distracting at best. Really, what does it have to do with Christ’s resurrection? I haven’t figured that out yet. However, these symbols have plenty to do with fertility and pagan ideas. “It’s just for fun” is counterproductive. The world and Satan will always win when it comes to providing fun. The church is to be the “pillar and ground of the truth” not entertainment centers. An attempt to compete with the world in this area cheapens the Bride of Christ. It is confusing to children. When we play around with the world’s ideas our children become unstable and unsure of what to believe in. The same thing happens when we tell children that Christmas is about the birth of Christ while playing the Santa game. Or when they get older we allow them to be indoctrinated with evolutionary teaching and then give them an hour a week in Sunday school to learn about the Genesis account of creation. Our children are confused and no wonder. We allow these things to affect them and then question why 80% leave the church by the end of high school. What you draw people with is what you draw them to. 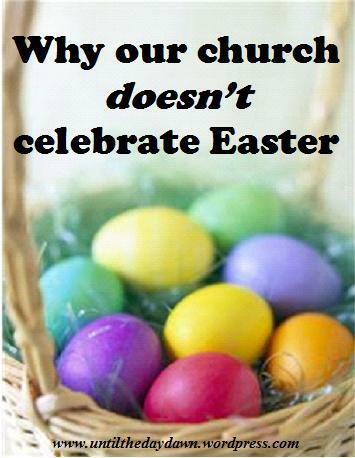 A church can use an egg hunt to draw people in (or any worldly event for that matter), but when we draw them in with activities, promotions, and such we are drawing them to those things. When we use the pure, unadulterated Word of God to draw people in, it is Christ alone that they are drawn to. “Set your affection on things above, not on things on the earth,” Colossians 3:2. We are called to be holy. We are to be set apart and peculiar. I’m afraid many have forgotten this. It is hard to be set apart while being the same. “But ye are a chosen generation, a royal priesthood, an holy nation, a peculiar people; that ye should shew forth the praises of him who hath called you out of darkness into his marvellous light: Which in time past were not a people, but are now the people of God: which had not obtained mercy, but now have obtained mercy. Dearly beloved, I beseech you as strangers and pilgrims, abstain from fleshly lusts, which war against the soul;” 1 Peter 2:9-11. We do as a church celebrate the resurrection of our Lord and Savior. The resurrection is, in fact, the hinge-pin of all of Christianity. Without it there is no hope. Without it our faith is in vain. Without it our loved ones would be gone for good. Without it we would still be in our sins. “If in this life only we have hope in Christ, we are of all men most miserable,” 1 Corinthians 15:19. But thank God we are not most miserable. Because of the resurrection of our Lord there is hope! The grave has been conquered! Sin not longer reigns! And death has no sting! This Sunday we will celebrate Resurrection Sunday with the living Christ being glorified, and his death and resurrection being preached! *note: My 16 year old son’s comment to this article was, “Mom, That was great. I agree with everything you said, but I think you will make people mad with your words.” So in reply to “making people mad” let me just say that is certainly not my intent. I hold no judgment over anyone. How you choose to celebrate is between your conscience and God alone. I write because there are so many misconceptions and fallacies regarding the church. Dear Christian, never forget that the world is watching us. They want to know if what we say we believe is real enough to make a difference in the way we live. Too many have a form of godliness, but deny the power (2 Timothy 3:5). They are denying the power of the Word of God to work in their life (1 Thessalonians 2:13). They are denying the power of Christ to crucify the old man (Romans 6:6). They are denying the power of God to keep them from practicing a lifestyle of sin (1 John 3:9). They are denying the power of the Holy Ghost to teach them spiritual things (1 Corinthians 2:10-13). I am so thankful for the way you bring the Word! These are my thoughts on this Good Friday. Looking forward since this morning to the celebration of Jesus’ resurrection! I’m rejoicing today in the salvation that Christ brought me! Thank you Kela! Rejoicing along with you on this day. Blessings!